Love vs fear and my mother’s prayers is a dark, interactive comedy about choosing a partner in the modern Afro-Diasporan context. 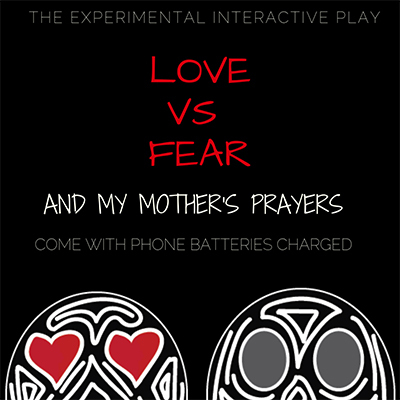 As an experience for all ages, love vs fear hopes to push new boundaries in the use of technology in theatre. The first experimental version of this project was taken to the Edinburgh fringe festival in 2017. This version allowed the audience to direct the ending of the play by participating in a multiplayer game using their mobile phones. The play can be seen by all ages, and the game element can allow for 20 players at a time. This installation hopes to inspire people through the story to trust one’s instinct. It also touches on topics such as love, the difficulties in choosing the right partner and the pressures of marriage on a woman in an African society. By combining art and technology, it also hopes to inspire people to innovate in unconventional ways and highlight the importance of diverse storytelling. Cocoabean Projects is a new theatre company looking to bridge the gap between technology and the arts while telling African inspired stories. It’s founder Bunmi is a multi-disciplinary creative whose interests are not limited to theatre production; she is also an illustrator and software engineer and currently working towards a data science degree. As a playwright, she is influenced by the works of Zulu Sofola and Wole Soyinka and hopes to inspire people with her stories, and her passion for mixing art and technology. She began Cocoabean Projects, a new media company looking to create new experiences with technology and art while telling African inspired stories as a means of expressing her passion.